Video abstract presented by José Alfredo Coelho Pereira. Background: The purpose of this study was to assess the efficacy of specific neuromodulation treatments performed with radio electric asymmetric conveyer (REAC) technology in the treatment of the symptomatic triad depression, anxiety, and stress by the use of a specific psychometric test such as the Depression Anxiety Stress Scale-42 items (DASS-42) version, which assesses simultaneously the severity of expression of this triad. Patients and methods: The design of this study was planned to compare two populations that performed DASS-42 test twice within a similar period of time. The first population performed the first DASS test before the treatment and the second test about 3 months later, at the end of two specific REAC neuromodulation treatments, neuropostural optimization (NPO) and neuropsychophysical optimization (NPPO), that have previously shown an efficacy in the treatment of depression, anxiety and stress. The second population (untreated), used as the randomized control group, consisted of a similar group by gender and age, who performed the DASS-42 test in an online platform twice, with an interval of about 3 months between the first and second tests, similar to the interval between the two tests in the treated group. Results: The comparison between the treated group and the control group points out the REAC treatment efficacy in improving the quality of life. 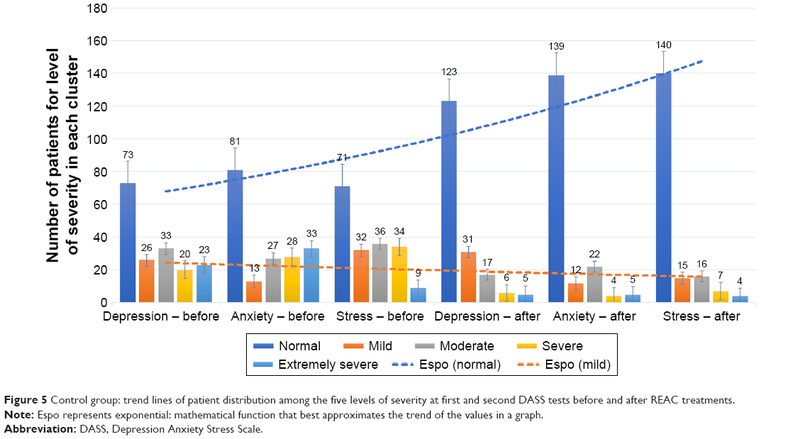 At the second DASS-42 test, self-administered about 3 months after the treatments, treated patients were positioned on average values of much milder severity in all the three clusters, depression, anxiety, and stress, while in untreated patients there was no significant difference between the mean values of the first and second DASS tests. Conclusion: The results obtained in this study, evaluated with the DASS-42 test, confirm that REAC-NPO and REAC-NPPO neuromodulation treatments can be useful tools for the clinical treatment of depression, anxiety, and stress, as already proven by previous results evaluated with different psychometric tests. Depression, anxiety, and stress represent a very common symptomatic triad that can afflict both healthy subjects at various stages of life1,2 and patients with various pathologies.3,4 Depression is a common occurrence in our modern society. Depression is usually linked to enhanced disability and psychosocial impairment and, in particular, it may be refractory to the common available psychoactive treatments. Interestingly, there is a trend toward improvements in the neurocognitive profile using specific techniques such as repetitive transcranial magnetic stimulation (rTMS) in the treatment-resistant depression.5 Anxiety is a condition, which inevitably affects everyone at some point throughout life. Stress is one of the conditions that unites everyone, but its definition is not univocal. There are different definitions for the term stress. The Stress Management Society (2009) defines stress as a situation where demands on a person exceed that person’s resources or ability to cope. The UK National Health Service (2009) defined stress as the way that you feel when pressure is placed on you. The International Stress Management Association (2009) defines stress as an adverse response to what an individual perceives as too much pressure. Stress is an unhealthy state of body or mind, or both. To try to give a measurement of this symptomatic triad, the Depression Anxiety Stress Scale-426 (DASS-42) was designed to measure the three related negative emotional states of depression, anxiety, and tension/stress. The purpose of this study is to assess the efficacy of specific neuromodulation treatments performed with REAC technology in the treatment of the symptomatic triad depression, anxiety, and stress by the use of a specific psychometric test such as the DASS test, which assesses simultaneously the severity of expression of this triad. The design of this study was planned to compare two populations that performed the first and the second DASS-42 tests within a similar period of time. The first population consisted of patients who went spontaneously to our clinics for various types of symptoms. During the initial screening the DASS-426 was administered. Patients who performed the DASS-42 test showing depression, anxiety, and stress levels were included in this group. This population was submitted in succession to two specific neuromodulation treatments that have previously shown an efficacy in the treatment of depression, anxiety, and stress. The first neuromodulation treatment with REAC technology was the neuropostural optimization (NPO)20–25 and the second neuromodulation treatment was the neuropsychophysical optimization (NPPO).9–19,26–32 The second population used as the randomized control group consisted of a similar group by gender and age, who spontaneously performed the DASS-42 test in an online platform, with a time interval similar to that passed for the treated group between the first and second DASS-42 administrations. This study design has allowed us to have an untreated random control group, of which we had no data other than gender, age, and time interval between the two tests, to be compared to a population subjected to REAC-NPO and -NPPO neuromodulation treatments. This study was approved by the ethical committee of the Federal University of Amapá with opinion number 2,980,082 and conducted in full compliance with the Declaration of Helsinki – Ethical principles for medical research involving human subjects. Patients have expressed their informed written consent to receive the treatments and participate in the study. The participants of the control group gave their consent by affirmatively answering the following disclaimer: the data collected in this test will be used for the purpose of calculating the test result, and for statistical analysis aimed to scientific studies. Accesses will be monitored. Do you authorize the use of data? The DASS-4233 is a 42-item self-report instrument designed by Syd Lovibond and Peter Lovibond in 1995. It was originally developed to provide maximum differentiation between depressive and anxious symptoms.33 This psychometric test is a measure of mental health focusing on the three traits of depression, anxiety, and stress. The test consists of a list of 42 symptoms, each of which is to be rated on a four-point scale. The depression scale assesses dysphoria, hopelessness, devaluation of life, self-deprecation, lack of interest/involvement, anhedonia, and inertia. The anxiety scale assesses autonomic arousal, skeletal muscle effects, situational anxiety, and subjective experience of anxious affect. The stress scale is sensitive to levels of chronic nonspecific arousal. It assesses difficulty relaxing, nervous arousal, and being easily upset/agitated, irritable/over-reactive, and impatient. Clear inclusion or exclusion criteria could not be determined for the control group, therefore, no inclusion or exclusion criteria were applied to the treated group. The only criterion applied to both groups was that they have a positivity for the depression, anxiety, and stress traits of the DASS-42 test. The group subjected to NPO and NPPO neuromodulation treatments consisted of a group of heterogeneous patients who visited our clinics for various symptoms. The patients who received DASS-42 and tested positive for traits of depression, anxiety, and stress were selected and included in this study. This group consisted of 182 people, 72 men with an average age of 52.65±17.92 years and 110 women with an average age of 53.22±15.16 years. The overall average age of the group was 52.99±16.26 years. The control group was obtained through a randomization software on a population of about 6,000 subjects who spontaneously carried out an evaluation test with an online version of the DASS-42 test.69 The only known data of this population were the gender, the declared age, and when spontaneously performed the first and second online tests. The randomization software was designed to search for a group of subjects similar for age, gender, and a time interval of about 6 months between the first and the second DASS-42 tests, compared to the population that had received REAC-NPO and -NPPO neuromodulation treatments. Obviously, the randomization software did not take into consideration other data than the results of the first and second DASS tests. This control group consisted of 182 people, 70 men with an average age of 50.88±14.71 years and 112 women with an average age of 45.34±13.36 years. The overall average age of the group was 47.47±14.52 years. REAC technology for therapeutic use is a technology platform for neuro-9–20,22,24,26–30,34 and bio-modulation.31,35–53 It generates a radio-electric emission of very low intensity. The radio-electric emission interacts with all the structures that contain electrical charges, such as the human body, and induces currents in them. These currents vary according to the molecular characteristics of the tissues. The peculiarity of REAC technology is not the radio-electric emission itself, but the particular physic link between the device and the patient’s body. The Asymmetric Conveyer Probe represents this link. This scheme has been developed for a specific purpose: to create an asymmetric circuit for better interaction with the asymmetric mechanism underlying the cell polarity,54 in order to optimize its functions. In fact, REAC technology is able to modulate the current flows existing both at cellular and body levels, when these are altered. Another peculiarity of REAC technology is the low power level used in radio frequency emission, <1 mW. This is necessary to induce current flows of intensity comparable with those of cell polarity. Higher power levels would disturb the adjustment mechanisms of cell polarity. The REAC technology is independent of the radio frequency emission used. REAC devices use the industrial, scientific, and medical bands 2.4 GHz and 5.8 GHz, allowed for these uses all over the world, according to the International Telecommunication Union regulations. In neurobiological modulation, the purpose of REAC technology is to recover and optimize the correct cell polarity, which is crucial for the transmission of interneuronal signals.55,56 Neurobiological modulation treatments with REAC technology unlike other neuromodulation/stimulation techniques such as transcranial magnetic stimulation57 (TMS) and transcranial direct current stimulation58 (tDCS), do not produce hyper- or hypo-polarization phenomena59,60 and have no depth limits20,22,25,61 and have long lasting action.25 The REAC-NPO neuromodulation treatment has shown to be able to optimize the neurotransmission in the whole encephalic mass, determining a more functional and economic response,20,22,25 also in neurodegenerative diseases such as Parkinson’s and Alzheimer’s.21,24,34 The REAC-NPO consists of a single treatment of 250 milliseconds administered on a specific area of the auricle/pavilion. The REAC-NPPO neuromodulation treatment has shown to be able to optimize and improve the coping capacity toward environmental stressors10–12,14,17–19 and be effective in various psychiatric disorders.9,13,15,16,26,29,30 The REAC-NPPO neuromodulation treatment consists of a treatment cycle of 18 sessions. Each session lasts around 3 seconds and the treatment is administered on a specific area of the auricle/pavilion. The REAC technology device used in this study was a B.E.N.E model (ASMED, Florence, Italy). For statistical analysis, we used SPSS 22 (IBM Corporation, Armonk, NY, USA). The data collected with the DASS have been analyzed with statistical tests, performed to check the adequacy of the data and procedure. The Wilcoxon and the Signs tests were used for the adequacy of the data (Table 1). Referred to the subdivision into treated group and control group, a marginal homogeneity test was applied to evaluate difference among the severity indicators (Table 2). For all the applied tests a statistical significance of P<0.05 was found. Abbreviation: Asymp. Sig., asymptotic significance. Abbreviations: Asymp. Sig., asymptotic significance; MH, marginal homogeneity. 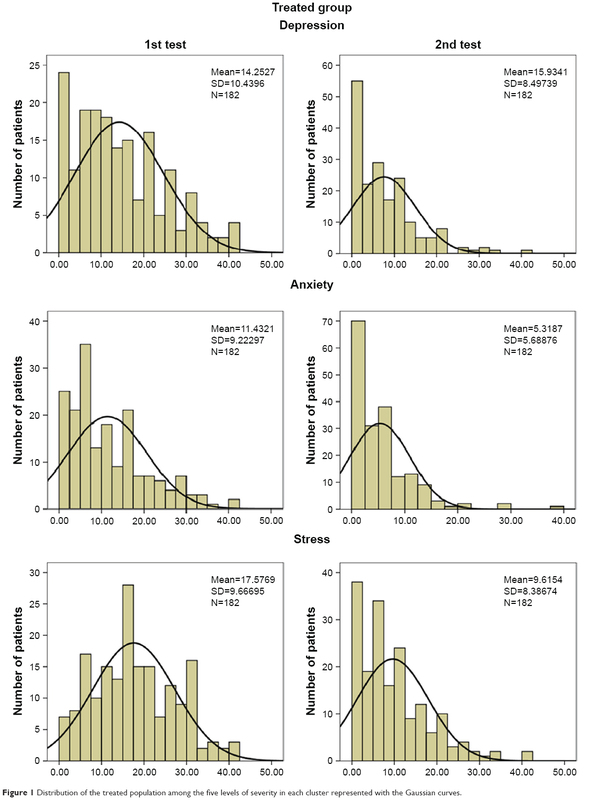 The DASS test indicators of severity for the clusters of depression, anxiety, and stress range from normal, moderate, mild, severe up to extremely severe. At the first self-administered test before the treatments, the treated group reported the following average values: for depression 14.253 (mild), anxiety 11.423 (mild), and stress 17.577 (moderate). 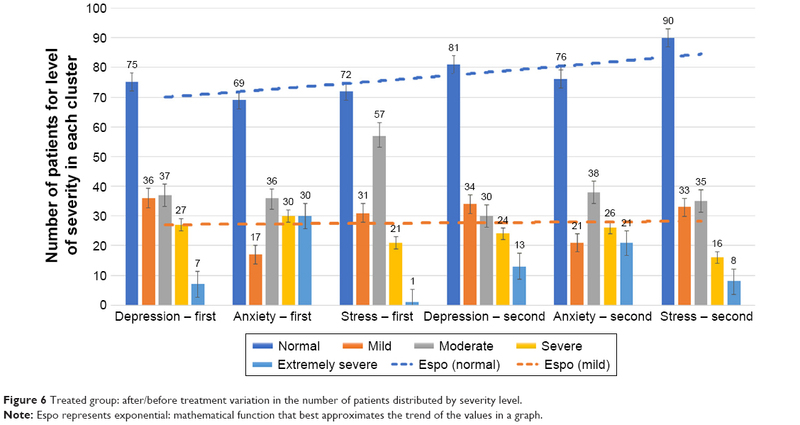 The distribution of the treated population among the five levels of severity in each cluster, as represented in the Gaussian bells of Figure 1A, C, and E, was the following: for depression 73 patients at normal level (0–9), 33 at moderate (10–13), 26 at mild (14–20), 20 at severe (21–28), and 23 at extremely severe (from 29 onward); for the cluster anxiety, 81 patients were at normal level (0–7), 27 at moderate (8–9), 13 at mild (10–14), 28 at severe (15–20), and 33 at extremely severe (from 21 onward); and for the cluster stress, 71 patients were at normal level (0–14), 32 at moderate (15–18), 36 at mild (19–24), 34 at severe (25–33), and nine at extremely severe (from 34 onward). Figure 1 Distribution of the treated population among the five levels of severity in each cluster represented with the Gaussian curves. At the second test, self-administered about 3 months after the treatments, the values recorded in the treated group were the following for each cluster: depression 7.593 (normal), anxiety 5.319 (normal), and stress 9.615 (normal). The distribution of the population among the five levels of severity in each cluster was (Figure 1B, D, and F): for depression, 123 patients at normal level (0–9), 17 at moderate (10–13), 31 at mild (14–20), six at severe (21–28), and five at extremely severe (from 29 onward); for the cluster anxiety, 139 patients at normal level (0–7), 22 at moderate (8–9), 12 at mild (10–14), four at severe (15–20), and five at extremely severe (from 21 onward); and for the cluster stress, 140 patients were at normal level (0–14), 16 at moderate (15–18), 15 at mild (19–24), seven at severe (25–33), and four at extremely severe (from 34 onward). At the first self-administered test, the untreated control group reported the following average values: for depression 12.648 (mild), anxiety 11.786 (moderate), and stress 16.582 (mild). 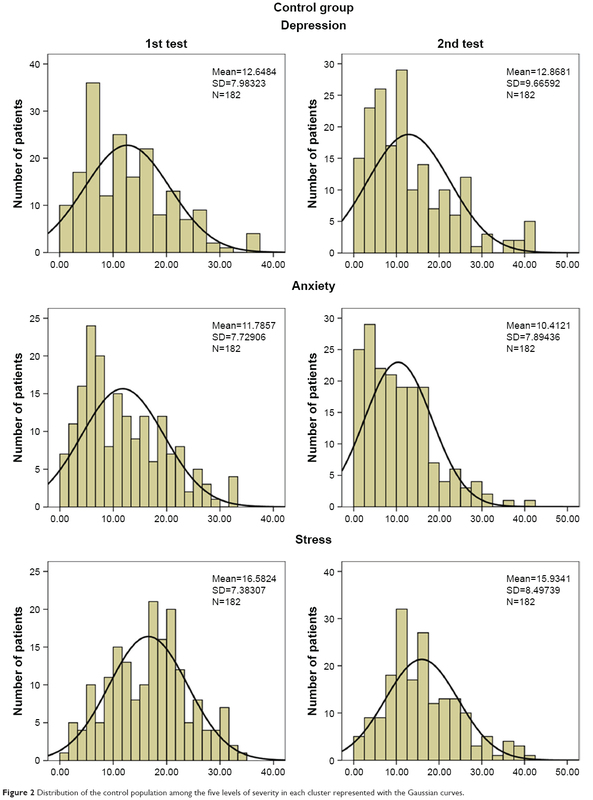 The distribution of the population among the five levels of severity in each cluster, as represented in the Gaussian bells of Figure 2A, C, and E, was the following: for depression, 75 patients at normal level (0–9), 37 at moderate (10–13), 36 at mild (14–20), 27 at severe (21–28), and seven at extremely severe (from 29 onward); for the cluster anxiety, 69 patients at normal level (0–7), 17 at moderate (8–9), 36 at mild (10–14), 30 at severe (15–20), and 30 at extremely severe (from 21 onward); and for the cluster stress, 72 patients were at normal level (0–14), 57 at moderate (15–18), 31 at mild (19–24), 21 at severe (25–33), and one at extremely severe (from 34 onward). At the second test, self-administered about 3 months after the first test, the average values recorded in the untreated control group were the following for each cluster: depression 12.868 (mild), anxiety 10.412 (moderate), and stress 15.934 (mild). Figure 2 Distribution of the control population among the five levels of severity in each cluster represented with the Gaussian curves. 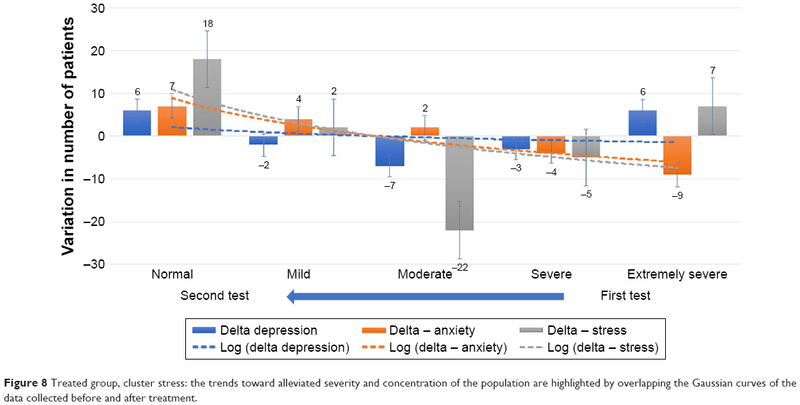 The distribution of the non-treated population among the five levels of severity in each cluster was (Figure 2B, D, and F): for depression, 80 patients at normal level (0–9), 30 at moderate (10–13), 34 at mild (14–20), 24 at severe (21–28), and 13 at extremely severe (from 29 onward); for the cluster anxiety, 76 patients at normal level (0–7), 38 at moderate (8–9), 21 at mild (10–14), 26 at severe (15–20), and 21 at extremely severe (from 21 onward); and for the cluster stress, 90 patients were at normal level (0–14), 35 at moderate (15–18), 33 at mild (19–24), 16 at severe (25–33), and eight at extremely severe (from 34 onward). The comparison between the treated group and the control group points out the REAC treatments efficacy in improving the quality of life. 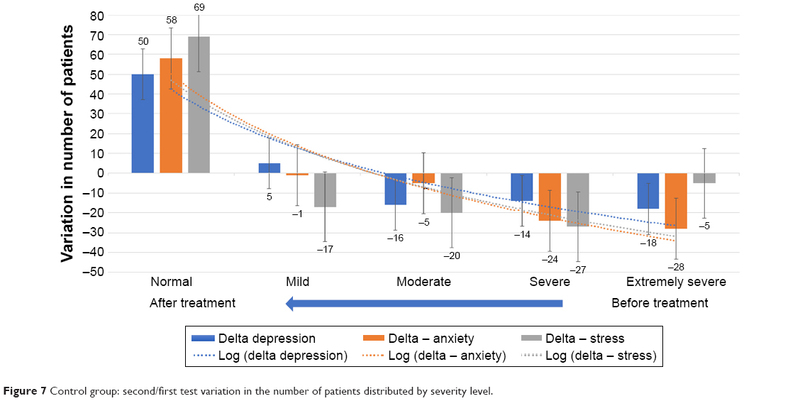 At the second DASS test, self-administered about 3 months after the treatments, we observed that treated patients were positioned on average values of much milder severity in all the three clusters, depression, anxiety, and stress (Figure 3), while in untreated patients there was no significant difference between the mean values of the first and second DASS tests (Figure 4). Figure 3 Control group: mean values of first and second DASS tests for each cluster before and after REAC treatments. Abbreviations: DASS, Depression Anxiety Stress Scale; REAC, radio electric asymmetric conveyer. Figure 4 Treated group: trend of patient distribution among the five levels of severity before and after REAC treatments. As shown in Figure 5, after the REAC treatments we observed that in each of the three clusters, treated patients settled in greater number on levels of severity tending to normality (blue dotted trend line), and at the same time we observed a decrease in the number of patients registering severity indicator values from mild onward (orange dotted trend line). Figure 5 Control group: trend lines of patient distribution among the five levels of severity at first and second DASS tests before and after REAC treatments. Note: Espo represents exponential: mathematical function that best approximates the trend of the values in a graph. Abbreviation: DASS, Depression Anxiety Stress Scale. In the control group, the trend lines showed a less evident shift in patients’ distribution toward milder severity levels, with minor differences between the first and second tests in the settlement of the population along the severity indicators scale for each of the three clusters (Figure 6). Figure 6 Treated group: after/before treatment variation in the number of patients distributed by severity level. Figures 7 and 8 are a graphical representation of the dynamics that occurred between the first and the second DASS tests, respectively, within the treated group and the control group. In the treated group, the shift of patients toward normality values after the treatment is evident in all three clusters, as evidenced by the dotted lines that make a marked curve toward normal values between the first and second tests. On the contrary, in the control group the curves representing the dynamic distribution of patients between the first and second tests are much less pronounced, meaning that the patients remained tendentially stationary on their severity values in all three clusters. Figure 7 Control group: second/first test variation in the number of patients distributed by severity level. Figure 8 Treated group, cluster stress: the trends toward alleviated severity and concentration of the population are highlighted by overlapping the Gaussian curves of the data collected before and after treatment. Similarly, the comparison between the Gaussian curves of Figures 1 and 2 show how after treatment the treated population tends to shift toward milder levels of severity (the apex of the curves tends to shift to the left), and to concentrate on these values (the curves tend to rise); on the contrary, in the control group the average values of the severity indicators remain substantially unchanged between the first and the second tests, as well as the shape of the Gauss curves representing the distribution of the population. Figure 9 shows as an example the cluster stress in the treated group and highlights the trends toward alleviated severity and concentration of the population, overlapping the Gaussian curves of before and after treatment. 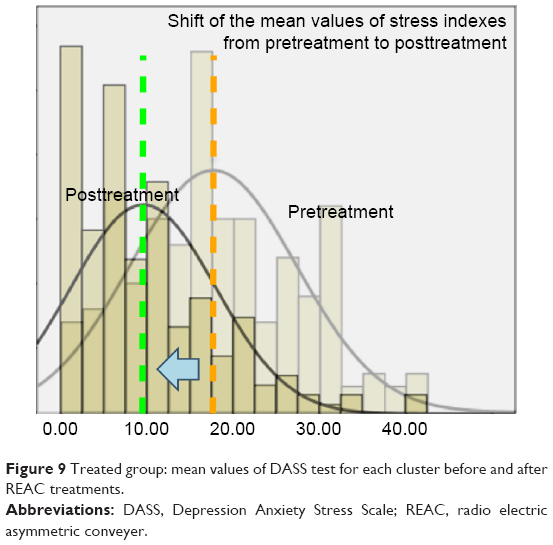 Figure 9 Treated group: mean values of DASS test for each cluster before and after REAC treatments. This research was carried out as part of an extensive project aimed at investigating the spread and the degree of depression, anxiety, and stress even in specific subpopulations, in order to verify the efficacy of neuromodulation treatments with REAC technology in improving the quality of life and eventually prevent the onset of self-injurious behaviors, like addictions. The main hypothesis of this study is to verify the possible large-scale use of REAC-NPO and -NPPO treatments as a tool to prevent and/or treat anxiety and depression, and to optimize the individual coping skills and the response to the environmental stressors. Depression and anxiety are widespread62,63 and very debilitating mental illnesses characterized by disorders of mood, cognitive function, and neurovegetative function. The neurovegetative aspects are often described as stress related disorders. Among these, for the depression, we list the main ones: difficulty with concentration or with making decisions, fatigue, excessive tiredness or low energy, feeling guilty or worthless, loss of interest or pleasure in general, anhedonia, loss of sexual interest or pleasure, psychomotor retardation or agitation, sleep disturbance, and suicidality. Depression, anxiety, and stress disorders in many cases were treated similarly, but the causes that may be at the origin of these three symptomatic frameworks can often be very different and difficult to identify. When this symptomatic triad is stress related, pharmacological therapies often have no target and are, therefore, ineffective. The fact that they cannot be effective on symptoms, does not exclude the fact that they can produce side effects, often not recognized as such, but interpreted as an aggravation of the existing symptomatic picture. These considerations often lead patients to seek nonmedical therapeutic approaches and induce researchers to find new therapeutic strategies. In recent years, there has been rapid progress in the field of neuroscience with regard to neurostimulation techniques, which have tried to compensate for pharmacological treatments where they proved to be ineffective, particularly in the context of drug-resistant depression. Today, thanks to continuous technological innovations, researchers and doctors have accessible devices able to implement therapeutic treatments of neuro-stimulation/modulation with various technologies,64 aimed at treating these mood disorders. In general, these methods work by sending an electric current through the brain. This electrical current, with mechanisms not yet fully known, alters the electrochemical and electrometabolic mechanisms acting on neural networks related to mood. The most widespread neurostimulation/modulation techniques to date64 are the electroconvulsive therapy,65 TMS, and rTMS for the treatment of resistant depression5 and tDCS.66 In comparison with these methods, neuromodulation with REAC technology shares the same therapeutic objectives, but it differs substantially both in the mechanism of action and depth of action, and in the cerebral volume affected by the stimulus. In fact, neuromodulation with REAC technology, unlike other techniques, does not lead to hyper- or hypo-polarization of the area subjected to stimulation, but it results in a functional reorchestration of the whole encephalic mass, well highlighted with functional magnetic resonance studies. In this scenario, REAC technology, due to its peculiar mechanism of action based on the cell polarity optimization,50 seems to open up new perspectives. Like all methods, REAC technology has its strengths and limits. Given the safety, noninvasiveness, complete absence of pain, or any other perception by the patient, REAC NPO and NPPO treatments are well accepted by the patients who receive them. Compared to pharmacological antidepressant therapy, the limitation of this method is that it cannot be self-administered by the patient and that currently it is not widely diffused. Sometimes subjective evaluation by patients and objective results of these treatments are quite difficult to evaluate. The DASS-42 is a 42 item self-report questionnaire designed to measure the severity of a range of symptoms common to depression, anxiety and stress. REAC-NPO and -NPPO are noninvasive and painless treatments, and their administration is easy and fast. Speed, specificity, and efficacy, without undesired or adverse effects, are features highly appreciated in clinical activity that can promote the use of these treatments in neuropsychical health promotion projects, even in large social communities. We thank Dr Alessandra Cappelli of Rinaldi Fontani Institute and Emanuele Sorrentino of Rinaldi Fontani Foundation for their precious cooperation. All authors contributed toward data analysis, drafting and critically revising the paper, gave final approval of the version to be published, and agreed to be accountable for all aspects of the work. There is potential competing interest as SR and VF are the inventors of REAC technology. They are also the founders of ASMED, the company that produces REAC technology. The authors report no other conflicts of interest in this work. Rallis S, Skouteris H, Mccabe M, Milgrom J. A prospective examination of depression, anxiety and stress throughout pregnancy. Women Birth. 2014;27(4):e36–e42. Booth-Kewley S, Highfill-Mcroy RM, Larson GE, Garland CF, Gaskin TA. Anxiety and depression in Marines sent to war in Iraq and Afghanistan. J Nerv Ment Dis. 2012;200(9):749–757. Torta R, Pennazio F, Ieraci V. Anxiety and depression in rheumatologic diseases: the relevance of diagnosis and management. Reumatismo. 2014;66(1):92–97. Buchberger B, Huppertz H, Krabbe L, Lux B, Mattivi JT, Siafarikas A. Symptoms of depression and anxiety in youth with type 1 diabetes: a systematic review and meta-analysis. Psychoneuroendocrinology. 2016;70:70–84. Serafini G, Pompili M, Belvederi Murri M, et al. The effects of repetitive transcranial magnetic stimulation on cognitive performance in treatment-resistant depression. A systematic review. Neuropsychobiology. 2015;71(3):125–139. Loo CK, Husain MM, Mcdonald WM, et al. International randomized-controlled trial of transcranial direct current stimulation in depression. Brain Stimul. 2018;11(1):125–133. Donse L, Padberg F, Sack AT, Rush AJ, Arns M. Simultaneous rTMS and psychotherapy in major depressive disorder: clinical outcomes and predictors from a large naturalistic study. Brain Stimul. 2018;11(2):337–345. Mannu P, Rinaldi S, Fontani V, Castagna A, Margotti ML. Radio electric treatment vs. Es-Citalopram in the treatment of panic disorders associated with major depression: an open-label, naturalistic study. Acupunct Electrother Res. 2009;34(3–4):135–149. Rinaldi S, Fontani V, Aravagli L, Margotti ML, Lotti Margotti M. Psychological and symptomatic stress-related disorders with radio-electric treatment: psychometric evaluation. Stress and Health. 2010;26(5):350–358. Rinaldi S, Fontani V, Aravagli L, Mannu P. Psychometric evaluation of a radio electric auricular treatment for stress related disorders: a double-blinded, placebo-controlled controlled pilot study. Health Qual Life Outcomes. 2010;8:31. Rinaldi S, Fontani V, Moretti E, et al. A new approach on stress-related depression and anxiety: neuro-psycho-physical-optimization with radio electric asymmetric-conveyer. Indian J Med Res. 2010;132:189–194. Fontani V, Mannu P, Castagna A, Rinaldi S. Social anxiety disorder: radio electric asymmetric conveyor brain stimulation versus sertraline. Patient Prefer Adherence. 2011;5:581–586. Fontani V, Rinaldi S, Aravagli L, Mannu P, Castagna A, Margotti ML. Noninvasive radioelectric asymmetric brain stimulation in the treatment of stress-related pain and physical problems: psychometric evaluation in a randomized, single-blind placebo-controlled, naturalistic study. Int J Gen Med. 2011;4:681–686. Mannu P, Rinaldi S, Fontani V, Castagna A, Margotti ML. Noninvasive brain stimulation by radioelectric asymmetric conveyor in the treatment of agoraphobia: open-label, naturalistic study. Patient Prefer Adherence. 2011;5:575–580. Olivieri EB, Vecchiato C, Ignaccolo N, et al. Radioelectric brain stimulation in the treatment of generalized anxiety disorder with comorbid major depression in a psychiatric Hospital: a pilot study. Neuropsychiatr Dis Treat. 2011;7:449–455. Rinaldi S, Fontani V, Aravagli L, et al. Stress-related Psycho-physiological disorders: randomized single blind placebo controlled naturalistic study of psychometric evaluation using a radio electric asymmetric treatment. Health Qual Life Outcomes. 2011;9:54. Fontani V, Aravagli L, Margotti ML, Castagna A, Mannu P, Rinaldi S. Neuropsychophysical optimization by REAC technology in the treatment of: sense of stress and confusion. Psychometric evaluation in a randomized, single blind, sham-controlled naturalistic study. Patient Prefer Adherence. 2012;6:195–199. Collodel G, Moretti E, Fontani V, et al. Effect of emotional stress on sperm quality. Indian J Med Res. 2008;128(3):254–261. Rinaldi S, Fontani V, Castagna A. Brain activity modification produced by a single radioelectric asymmetric brain stimulation pulse: a new tool for neuropsychiatric treatments. Preliminary fMRI study. Neuropsychiatr Dis Treat. 2011;7:649–654. Fontani V, Rinaldi S, Castagna A, Margotti ML. Noninvasive radioelectric asymmetric conveyor brain stimulation treatment improves balance in individuals over 65 suffering from neurological diseases: pilot study. Ther Clin Risk Manag. 2012;8:73–78. Mura M, Castagna A, Fontani V, Rinaldi S. Preliminary pilot fMRI study of neuropostural optimization with a noninvasive asymmetric radioelectric brain stimulation protocol in functional dysmetria. Neuropsychiatr Dis Treat. 2012;8:149–154. Olazarán J, González B, López-Álvarez J, et al. Motor effects of REAC in advanced Alzheimer’s disease: results from a pilot trial. J Alzheimers Dis. 2013;36(2):297–302. Olazarán J, González B, Osa-Ruiz E, et al. Motor effects of radio electric asymmetric conveyer in Alzheimer’s disease: results from a cross-over trial. J Alzheimers Dis. 2014;42(1):325–332. Rinaldi S, Mura M, Castagna A, Fontani V. Long-lasting changes in brain activation induced by a single REAC technology pulse in Wi-Fi bands. Randomized double-blind fMRI qualitative study. Sci Rep. 2014;4:5668. Castagna A, Rinaldi S, Fontani V, Aravagli L, Mannu P, Margotti ML. Does osteoarthritis of the knee also have a psychogenic component? Psycho-emotional treatment with a radio-electric device vs. intra-articular injection of sodium hyaluronate: an open-label, naturalistic study. Acupunct Electrother Res. 2010;35(1–2):1–16. Castagna A, Rinaldi S, Fontani V, Mannu P. Radioelectric asymmetric brain stimulation and lingual apex repositioning in patients with atypical deglutition. J Multidiscip Healthc. 2011;4:209–213. Castagna A, Rinaldi S, Fontani V, Mannu P, Margotti ML. Comparison of two treatments for coxarthrosis: local hyperthermia versus radio electric asymmetrical brain stimulation. Clin Interv Aging. 2011;6:201–206. Mannu P, Rinaldi S, Fontani V, Castagna A. Long-term treatment of bipolar disorder with a radioelectric asymmetric conveyor. Neuropsychiatr Dis Treat. 2011;7:373–379. Mannu P, Rinaldi S, Fontani V, Castagna A. Radio electric asymmetric brain stimulation in the treatment of behavioral and psychiatric symptoms in Alzheimer disease. Clin Interv Aging. 2011;6:207–211. Collodel G, Rinaldi S, Moretti E, et al. The effect of radio electric asymmetric conveyer treatment on sperm parameters of subfertile stallions: a pilot study. Reprod Biol. 2012;12(3):277–284. Pereira Coelho JA, Rinaldi A, Fontani V, Rinaldi S. REAC neuromodulation treatments in subjects with severe socio-economic and cultural hardship in the Brazilian state of Pará. A family observational pilot study. Neuropsychiatr Dis Treat. 2018;14:1047–1054. Lovibond PF, Lovibond SH. The structure of negative emotional states: comparison of the depression anxiety stress scales (DASS) with the Beck depression and anxiety inventories. Behav Res Ther. 1995;33(3):335–343. Castagna A, Fontani V, Rinaldi S, Mannu P. Radio electric tissue optimization in the treatment of surgical wounds. Clin Cosmet Investig Dermatol. 2011;4:133–137. Fontani V, Castagna A, Mannu P, Rinaldi S. Radioelectric asymmetric stimulation of tissues as treatment for post-traumatic injury symptoms. Int J Gen Med. 2011;4:627–634. Maioli M, Rinaldi S, Santaniello S, et al. Radiofrequency energy loop primes cardiac, neuronal, and skeletal muscle differentiation in mouse embryonic stem cells: a new tool for improving tissue regeneration. Cell Transplant. 2012;21(6):1225–1233. Rinaldi S, Maioli M, Santaniello S, et al. Regenerative treatment using a radioelectric asymmetric conveyor as a novel tool in antiaging medicine: an in vitro beta-galactosidase study. Clin Interv Aging. 2012;7:191–194. Collodel G, Fioravanti A, Pascarelli NA, et al. Effects of regenerative radioelectric asymmetric conveyer treatment on human normal and osteoarthritic chondrocytes exposed to IL-1β. A biochemical and morphological study. Clin Interv Aging. 2013;8:309–316. Maioli M, Rinaldi S, Santaniello S, et al. Anti-senescence efficacy of radio-electric asymmetric conveyer technology. Age. 2014;36(1):9–20. Maioli M, Rinaldi S, Santaniello S, et al. Radio electric conveyed fields directly reprogram human dermal skin fibroblasts toward cardiac, neuronal, and skeletal muscle-like lineages. Cell Transplant. 2013;22(7):1227–1235. Rinaldi S, Iannaccone M, Magi GE, et al. Physical reparative treatment in reptiles. BMC Vet Res. 2013;9(1):39. Maioli M, Rinaldi S, Santaniello S, et al. Radioelectric asymmetric conveyed fields and human adipose-derived stem cells obtained with a nonenzymatic method and device: a novel approach to multipotency. Cell Transplant. 2014;23(12):1489–1500. Rinaldi S, Maioli M, Pigliaru G, et al. Stem cell senescence. Effects of REAC technology on telomerase-independent and telomerase-dependent pathways. Sci Rep. 2014;4:6373. Maioli M, Rinaldi S, Migheli R, et al. Neurological morphofunctional differentiation induced by REAC technology in PC12. A neuro protective model for Parkinson’s disease. Sci Rep. 2015;5:10439. Panaro MA, Carofiglio V, Calvello R. Modulation of pro-inflammatory response in a mouse model of Parkinson’s disease by non-invasive physical approach. Paper presented at: 2015 IEEE 15th Mediterranean Microwave Symposium (MMS); Lecce, Italy; November 30 – December 2, 2015. Available from: https://ieeexplore.ieee.org/xpl/mostRecentIssue.jsp?punumber=7369478. Accessed February 8, 2019. Rinaldi S, Calzà L, Giardino L, Biella GE, Zippo AG, Fontani V. Radio electric asymmetric conveyer: a novel neuromodulation technology in Alzheimer’s and other neurodegenerative diseases. Front Psychiatry. 2015;6:22. Zippo AG, Rinaldi S, Pellegata G, et al. Electrophysiological effects of non-invasive radio electric asymmetric conveyor (REAC) on thalamocortical neural activities and perturbed experimental conditions. Sci Rep. 2015;5:18200. Lorenzini L, Giuliani A, Sivilia S, et al. REAC technology modifies pathological neuroinflammation and motor behaviour in an Alzheimer’s disease mouse model. Sci Rep. 2016;6:35719. Maioli M, Rinaldi S, Pigliaru G, et al. REAC technology and hyaluron synthase 2, an interesting network to slow down stem cell senescence. Sci Rep. 2016;6:28682. Berlinguer F, Pasciu V, Succu S, et al. REAC technology as optimizer of stallion spermatozoa liquid storage. Reprod Biol Endocrinol. 2017;15(1):11. Panaro MA, Aloisi A, Nicolardi G, et al. Radio electric asymmetric Conveyer technology modulates neuroinflammation in a mouse model of neurodegeneration. Neurosci Bull. 2018;34(2):270–282. Sanna Passino E, Rocca S, Caggiu S, et al. REAC regenerative treatment efficacy in experimental chondral lesions: a pilot study on ovine animal model. Clinical Interventions in Aging. 2017;12:1471–1479. Cibrian-Uhalte E, Abdelilah-Seyfried S. Cell polarity. In: Encyclopedic Reference of Genomics and Proteomics in Molecular Medicine. Berlin, Heidelberg: Springer Berlin Heidelberg; 2006:237–243. Urban NN, Castro JB. Functional polarity in neurons: what can we learn from studying an exception? Curr Opin Neurobiol. 2010;20(5):538–542. Horton AC, Ehlers MD. Neuronal polarity and trafficking. Neuron. 2003;40(2):277–295. Nahas Z. Handbook of transcranial magnetic stimulation. J Psychiatr Neurosci. 2003;28(5):373–375. Mameli F, Fumagalli M, Ferrucci R, Priori A. Chapter 13 – Transcranial Direct Current Stimulation and Cognition in the Elderly A2 – Kadosh, Roi Cohen. In: The Stimulated Brain. San Diego: Academic Press; 2014:371–395. Coop AD, Mckay DR, Lancaster J, Fox PT. Single neuron electrophysiology of transcranial magnetic stimulation. I. Passive responses. BMC Neuroscience. 2010;11(Suppl 1):P86. Pirulli C, Fertonani A, Miniussi C. Is neural hyperpolarization by cathodal stimulation always detrimental at the behavioral level? Front Behav Neurosci. 2014;8(110):226. Sliwinska MW, Vitello S, Devlin JT. Transcranial magnetic stimulation for investigating causal Brain-behavioral relationships and their time course. J Vis Exp. 2014;89(89):51735. Bandelow B, Michaelis S. Epidemiology of anxiety disorders in the 21st century. Dialogues Clin Neurosci. 2015;17(3):327–335. Lecrubier Y. Widespread underrecognition and undertreatment of anxiety and mood disorders: results from 3 European Studies. J Clin Psychiatry. 2007;68(Suppl 2):36–41. Akhtar H, Bukhari F, Nazir M, Anwar MN, Shahzad A. Therapeutic efficacy of neurostimulation for depression: techniques, current modalities, and future challenges. Neurosci Bull. 2016;32(1):115–126. Oremus C, Oremus M, Mcneely H, et al. Effects of electroconvulsive therapy on cognitive functioning in patients with depression: protocol for a systematic review and meta-analysis. BMJ Open. 2015;5(3):e006966. UK ECT Review Group. Efficacy and safety of electroconvulsive therapy in depressive disorders: a systematic review and meta-analysis. The Lancet. 2003;361(9360):799–808. Ronk FR, Korman JR, Hooke GR, Page AC. Assessing clinical significance of treatment outcomes using the DASS-21. Psychol Assess. 2013;25(4):1103–1110. Vignola RC, Tucci AM. Adaptation and validation of the depression, anxiety and Stress Scale (DASS) to Brazilian Portuguese. J Affect Disord. 2014;155:104–109. Istituto Rinaldi Fontani. O teste DASS [DASS test]. Available from: http://www.irf.it/das/index_p.htm. Accessed February 7, 2019. Portuguese.